Welcome to my "Strength and Comparison" article for the coming week. The article "Ranking, Rating and Score" has also been published. 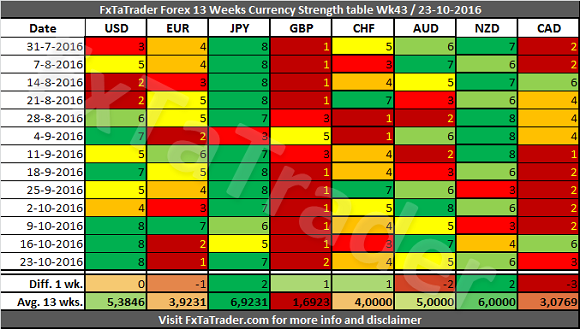 When looking at the Currency Strength in the table here below we can see that the USD is the strongest currency, the EUR is the weakest and the CAD is back again to the lower range while the NZD is back to the higher range. The USD, JPY and NZD clearly got stronger in the last week and the EUR and CAD weaker. For more details read both of my articles where the relevant Charts and Tables are provided. The USD(Strong) has an average score higher but close to the AUD(Neutral). It had however 7 times a higher score in the last 13 weeks so it is clearly still stronger but may become a Neutral currency. This was avoided last weeks because of the high score of 8 in these last 3 weeks. The EUR(Weak) has an average score lower but close to the CHF(Neutral). 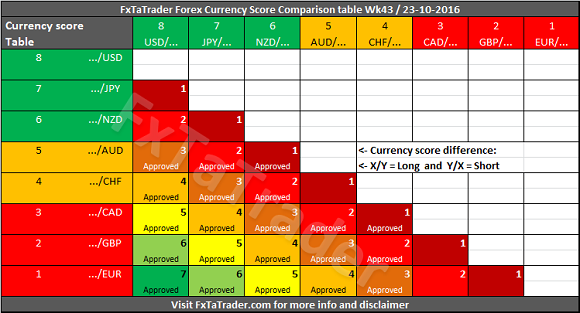 It had only 5 times a higher score in the last 13 weeks so it is clearly the weaker currency. The EUR however is more in the range of the Neutral currencies than the Weak currencies. Because of the low score of last 2 weeks it remains a Weak currency for now. This currency will be monitored closely in the coming weeks and may become a Neutral currency. 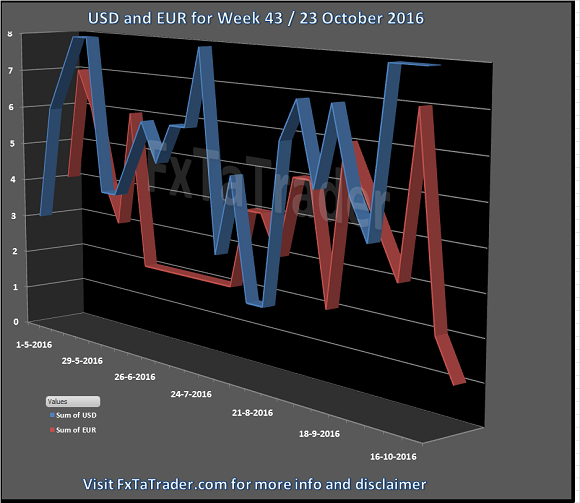 Here below you can see the Weekly Currency Score Chart of the USD and EUR with 6 months data as a reference. As can be seen the USD is back to the higher range of the strong currencies. However, in the months of July, August and September it was in the range of the Neutral currencies. For the EUR it is the other way around. It was also in the Neutral range in the same period but it is now back to the range of the Weak currencies. That is the reason why both currencies are having an Average 13 Weeks Score near to the Neutral currencies AUD and CHF. When looking at the TA Charts of this combination there is a clear direction with momentum and that is why this pair is also in the list of the longer term trade based on the Technical Analysis (TA) of the Daily and Weekly chart, see the bottom of this article for more information. As long as the currencies remain in their current range or only one of the 2 currencies goes to the Neutral range the momentum may still be good. Currencies with a high deviation seem less interesting to trade because they are less predictable. There are no deviating currencies for this week. See the Strength and Compariosn table for more information. Some of the pairs in the "Currency Comparison Table" comply for a longer term trade based on the Technical Analysis (TA) of the Daily and Weekly chart. For the coming week these seem to be: GBP/JPY, GBP/USD, EUR/USD, EUR/JPY, GBP/AUD, GBP/NZD, EUR/NZD, EUR/AUD, USD/CHF and NZD/CAD.